V-Band Exhaust Flange & Clamp Sets are an excellent alternative to flanged or slip fit tube connections. V-Band Flange & Clamps work especially well under operating conditions involving stress, temperature fluctuations and excessive vibration. PRO Racing V-Band sets come with a Flexloc nut rather than a Nyloc nut as offered on other brands. The Flexloc nut contains no other materials so will not melt and release like cheaper sets using Nyloc nuts. Our V-Band Clamp & Flanges allow for a quick and easy install and removal while giving a gasket free seal, our V-Band Clamps have 300 series stainless steel bands and retainers and come with a industry standard T-bolt latch and the V- Flanges are made of quality 304 Stainless Steel. PRO Racing Exhaust Flexi Joints are the perfect solution for reducing the rigidness of your exhaust system by flexing with the engine under acceleration and high revving, they also reduce the chance of your exhaust manifold cracking. 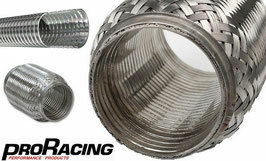 These new designed exhaust flexi pipes have a stainless braided outside with a unique double bellow middle and coil wound interlocking center. 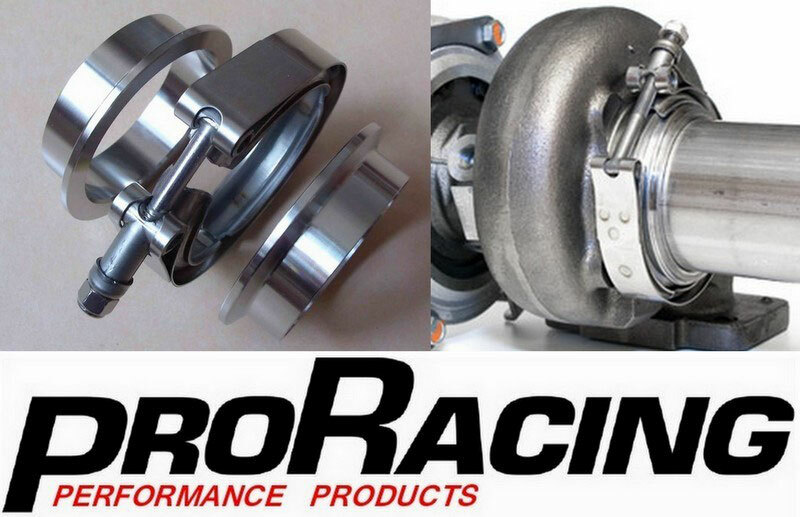 *JUST LANDED* 1.5" (38mm) and 1.75" (44mm) Short Flexi's to suit Wastegate Downpipes - PLUS 4" (102mm) Short and Standard Size Exhaust Flexi's for that Xtreme Performance Exhaust System or great for Trucks & Heavy Machinery. Interlock liner creates an air gap between the liner and bellows improving the cooling of the exhaust gas.